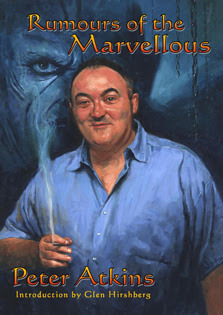 Rumours of the Marvellous is now available to pre-order via The Alchemy Press. The official launch is October 1st at FantasyCon 2011 in Brighton, UK. This collection of fourteen stories, limited to 250 signed and numbered copies, features an introduction by Glen Hirshberg and a cover painting by Les Edwards, and is co-produced by The Alchemy Press and Airgedlamh Productions. Contents: King of Outer Space / Stacy and Her Idiot / Between the Cold Moon and the Earth / Doctor Arcadia / Intricate Green Figurines / The Cubist’s Attorney / Prisoners of the Inferno / The Girl in the Blue Volcano / The Show Must Go On / The Mystery / Aviatrix / The Last of the Invisible Kings / Frumpy Little Beat Girl / Dancing Like We’re Dumb (original to this collection). I have now ordered this at last Pete. I loved Morningstar (and will re-read it someday soon! ), and tracked down a copy of Big Thunder which is in my 'to-read mountain', so this collection had to be added to the list. Very much appreciated, sir. Many thanks, and hope you enjoy it. It should be with me in the next few days, and it is the very least I can do for the bloke who stoked my love of Avengers comics! Whoa!! Wait a minute -- Are you Leon Mallett? !